We all start as a beginner. We are all bound to make a mistake or two. After all, we are all human and that’s part of our nature. With the ever changing hiking gear, we are still prone to some beginner mistakes. Whenever we hike, we should keep in mind the things below. Not all beginners make the same mistakes and some of the most common mistakes are easily correctable. It’s really important to stretch before your hike. Your legs, arms and abs could not be used to hiking yet and it’s important that you stretch out those muscles. This will help you feel more relaxed. Carrying out a few simple stretches before and after hiking could help prevent injuries along the trail as well as aching muscles at the end of your hike. A simple stretch that can be done anytime is the calf stretch which releases your legs from muscle spasms. This is one of the most notorious mistakes of a beginner hiker. It could be too much clothes, food, or water. We noticed on one recent hike that hikers were carrying two pairs of shoes to hike in. At a bare minimum, it’s best to consider one shoe that is suitable for all terrains. 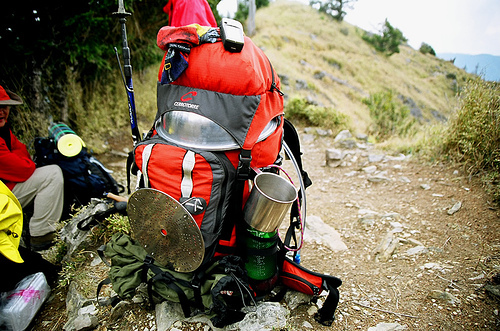 Try to evaluate your gear beforehand to lighten the load and make packing easier. Start with handling every item you want to carry and feel the weight. Shakedown the unnecessary items! Different weather and terrain call for different clothing for hiking. If you’re doing a day hike wearing cotton is perfectly fine. However, for long multi-day treks or long distance hikes, cotton is not the best choice of fabrics as it tends to absorb odors and retain moisture. Other choices of clothing materials include polyester which can dry faster in a downpour. Wool socks versus cotton socks are recommended as well. Also, it’s best to leave the blue jeans at home! The weather forecast is something that can be checked a day before your hike. By not knowing the weather, you are exposing yourself to adverse weather risks like rain or wind that present unforeseen dangers. Just taking a few minutes to do a quick look at the weather conditions can determine what you need to pack like boots or rain jackets. Also, sometimes mountains may require morning summits for notorious rains in the afternoon. Do research ahead of time! As a beginner you might not be the quickest or strongest hiker. In additional might think a hike is shorter than it actually is. It’s important to evaluate your hike by difficult and weather and then evaluate the number of hours this might take. To do this, check the time after 1 mile of hiking and re-estimate the number of hours it takes to complete the hike. You might find that doing a summit hike in the morning is faster than at the end of the day when the sun sets as you hike at a slower pace. Check out the next page for 5 more common mistakes!